The GCU contingent was a happy group after Storage Together won the title in Barcelona. 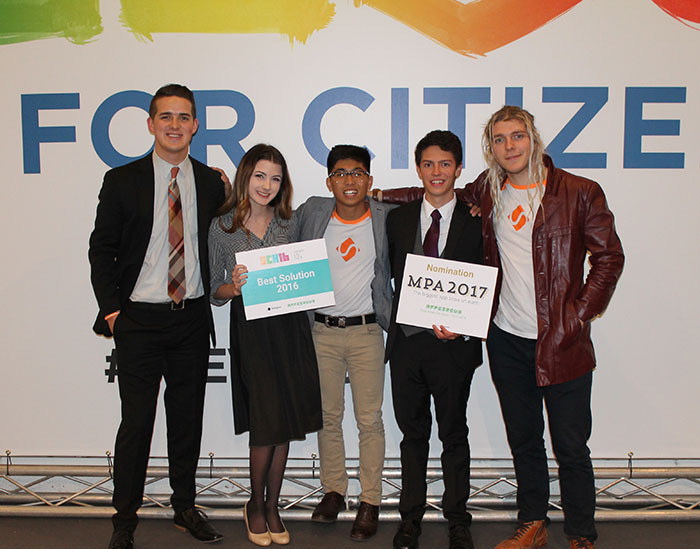 From left: Braeden Scheer, Chelsea Evans, Luke Amargo, Josh McGuire and Jedidiah Woods. It’s official: Storage Together is the best up-and-coming business concept on Earth. 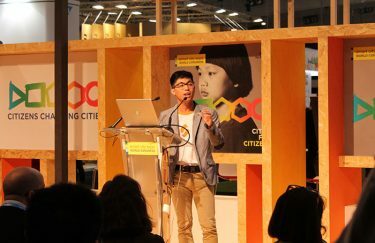 The idea was named the overall champion and declared the “Best Solution” at this week’s Smart City App Hack international finals competition in Barcelona. 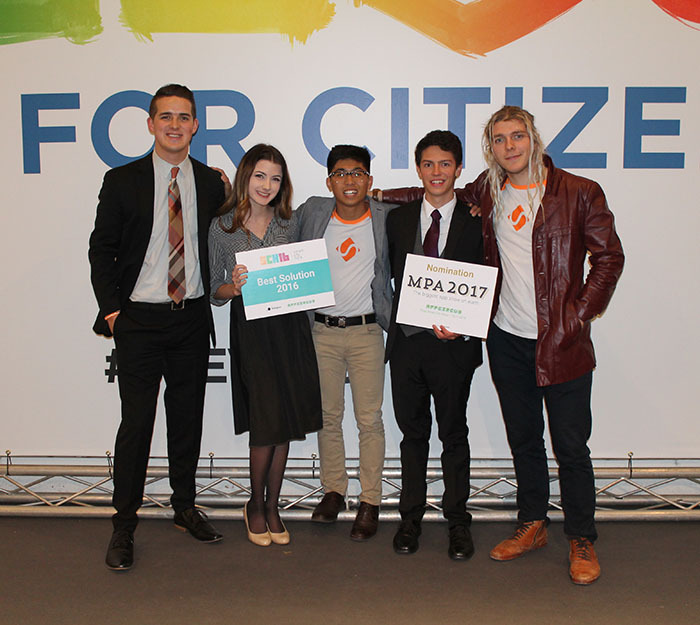 Chelsea Evans, Josh McGuire, Jedidiah Woods and Braeden Scheer took top honors among 10 competing business ideas from around the world. Luke Amargo makes the presentation in Barcelona. As founder and brainchild behind the idea, Amargo conducted the three-minute presentation and answered questions from a four-person panel of judges (competition rules dictated that only one person was allowed to present). The four-person business team repeatedly revised their business plans and presentation, and networked with hundreds of fellow entrepreneurs as they attempt to start a business that connects those who need storage with those who have space to share. In addition to the “world champion” title, the team is also invited back to Barcelona in 2017 to participate in the Mobile Premier Awards (MPA), a global app show and presentation exhibition. “The (judges) reviewed each company’s capacity and applicability to these criteria, the company’s ability to be monetized, and ultimately the company’s potential impact on being a smarter and more innovative way to positively impact the citizens and people it interacts with,” Scheer wrote in an email. Both Scheer and Woods wrote that answering challenging, pointed and effective questions from the panel during the Q&A portion of the competition helped differentiate Storage Together from a few other challengers. They arrived prepared. Tim Kelley, assistant professor in the Colangelo College of Business and one of the group’s top advisers, noted a last-minute “practice pitch” made to Kelley and CCOB Dean Dr. Randy Gibb before the trip resulted in some late alterations and re-evaluations. Kelley also noted that Storage Together and last year’s runner-up in Barcelona, ParkX, a parking meter payment app, are the tip of the iceberg in entrepreneurial companies with GCU roots “coming down the pipeline.” He praised the team’s work ethic, flexibility within their business model and plans, and, at times, thick skin. “They’ve been proactive and utilized resources from the team,” said Kelley, who estimated that the Storage Together team has pitched its idea in various ways to various audiences at least 60 times. “We love it, and we love the initiative. Kids that engage like this is why we’re here. That’s what we do. The team met more than 500 other business professoinals and exchanged dozens of business cards during this week’s competition. They’ve already contacted several of the people met during the competition about future business and financial opportunities. Their final day in Spain (Friday) will include some R&R as they attempt a trip to the Mediterranean Sea to “take in some of culture of Barcelona as a brief break from the extreme effort, because when we get back to the States, it’s ‘go time,’” Woods wrote. The triumphant team returns to Phoenix this weekend, where plenty of schoolwork and sleep await. But not for long. Kelley said networking and the ability to fund Storage Together to launch and sustain the business are the next huge challenges. A visit to Spain and a “World’s Best” title make for a pretty good business trip. Here’s a Storage Together video from the Smart City Hack app competition in Barcelona.